The Vice President, Shri M. Venkaiah Naidu addressing the gathering at an event where Amma - Sri Mata Amritanandamayi Devi was present, at his residence, in New Delhi on March 20, 2018. 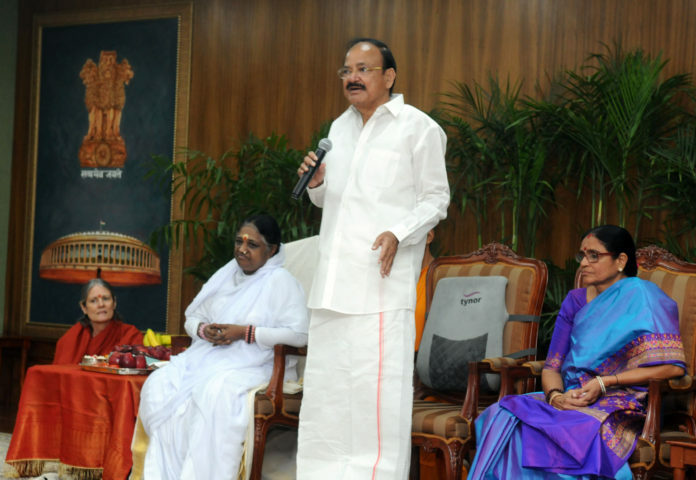 New Delhi: The Vice President of India, Shri M. Venkaiah Naidu has said that Sri Mata Amritanandamayi Devi is a great inspiration to the people who wanted to do something to society. He was addressing the gathering at an event where he interacted and took blessings from Sri Mata Amritanandamayi Devi, here today. The Judge in Supreme Court of India, Justice N.V. Ramana, the Deputy Chairman of Rajya Sabha, Prof. P.J. Kurien, the Secretary General of Rajya Sabha, Shri Desh Deepak Verma, the Secretary, Vice President Secretariat, Dr. I.V. Subba Rao and other dignitaries were present on the occasion. The Vice President said that Amma is an embodiment of Love and Compassion, Insight and Inspiration, Wisdom and Action, Laughter and Light. He further said that what she gives to the world is her love and affection. She is like a mother who gives her love and affection to her children. Amma do not make any distinction between her children, he added. The Vice President said that she is a symbol of Universal Motherhood which accepts and embraces everything, a life of pure giving and celebration. She is an example who can extend the love and affection to human beings with her extraordinary qualities and missionary zeal, he added.